Time Out gives ‘Much Ado’ 4 Stars! “Sigh no more, ladies (and gents), sigh no more. Instead, you should rejoice—and then nip out tobuy tickets from Theatre for a New Audience. In a masterstroke, Arin Arbus’s frequently charming production of Much Ado About Nothing has cast Jonathan Cake as Benedick, and his agile, gleeful performance drives out any possibility—any thought at all—of woe. Deceptions abound in Shakespeare’s Messina. In an atmosphere rife with masquerades and love tricks, Benedick’s friends, the prince Don Pedro (Graham Winton) and Claudio (Matthew Amendt), are gulled by wicked Don John (Saxon Palmer) into believing the worst about Claudio’s betrothed, Hero (Michelle Beck). Indeed, almost all of the “plot” rests on these machinations, but you’ll barely notice. 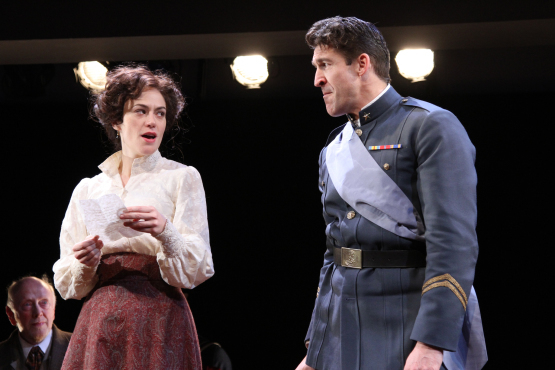 As the marriage-hating Benedick and his sparring partner, Beatrice (the always-magnetic Maggie Siff), turn inevitably toward love, the whole play moves helplessly in their wake. The production has clearly heeded British director Trevor Nunn’s comment that the play must be done with “sufficient seriousness.” Riccardo Hernandez’s set is all shadowy black corners, with one tree and a swing for frolicking; Donald Holder’s lighting design scrimps on brightness, then shines the occasional awkward (but necessary) spotlight. Maggie Siff and Jonathan Cake. Photographed at The Duke on 42nd Street by Gerry Goodstein. Click here to read the review online!